Factory owners used the same rationale for the exceedingly low wages they paid to children. Children were small enough to fit easily among the machines and could be hired for simple work for a fraction of an adult man’s pay. 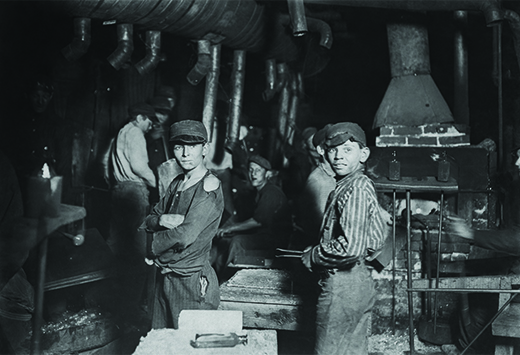 The image below ([link]) shows children working the night shift in a glass factory. From 1870 through 1900, child labor in factories tripled. Growing concerns among progressive reformers over the safety of women and children in the workplace would eventually result in the development of political lobby groups. Several states passed legislative efforts to ensure a safe workplace, and the lobby groups pressured Congress to pass protective legislation. However, such legislation would not be forthcoming until well into the twentieth century. In the meantime, many working-class immigrants still desired the additional wages that child and women labor produced, regardless of the harsh working conditions. Public opinion was not sympathetic towards labor’s violent methods as displayed by the Molly Maguires. But the public was further shocked by some of the harsh practices employed by government agents to crush the labor movement, as seen the following year in the Great Railroad Strike of 1877. After incurring a significant pay cut earlier that year, railroad workers in West Virginia spontaneously went on strike and blocked the tracks ([link]). 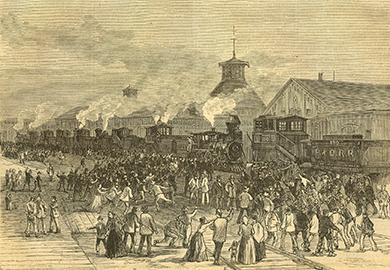 As word spread of the event, railroad workers across the country joined in sympathy, leaving their jobs and committing acts of vandalism to show their frustration with the ownership. Local citizens, who in many instances were relatives and friends, were largely sympathetic to the railroad workers’ demands. In one night, however, the KOL’s popularity—and indeed the momentum of the labor movement as a whole—plummeted due to an event known as the Haymarket affair, which occurred on May 4, 1886, in Chicago’s Haymarket Square ([link]). There, an anarchist group had gathered in response to a death at an earlier nationwide demonstration for the eight-hour workday. 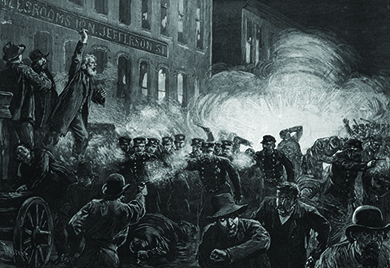 At the earlier demonstration, clashes between police and strikers at the International Harvester Company of Chicago led to the death of a striking worker. The anarchist group decided to hold a protest the following night in Haymarket Square, and, although the protest was quiet, the police arrived armed for conflict. Someone in the crowd threw a bomb at the police, killing one officer and injuring another. The seven anarchists speaking at the protest were arrested and charged with murder. They were sentenced to death, though two were later pardoned and one committed suicide in prison before his execution. On May 1, 1886, recognized internationally as a day for labor celebration, labor organizations around the country engaged in a national rally for the eight-hour workday. While the number of striking workers varied around the country, estimates are that between 300,000 and 500,000 workers protested in New York, Detroit, Chicago, and beyond. In Chicago, clashes between police and protesters led the police to fire into the crowd, resulting in fatalities. 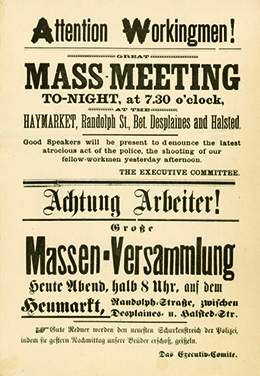 Afterward, angry at the deaths of the striking workers, organizers quickly organized a “mass meeting,” per the poster below ([link]). 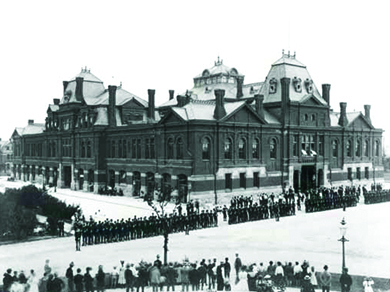 Two years later, in 1894, the Pullman Strike was another disaster for unionized labor. The crisis began in the company town of Pullman, Illinois, where Pullman “sleeper” cars were manufactured for America’s railroads. When the depression of 1893 unfolded in the wake of the failure of several northeastern railroad companies, mostly due to overconstruction and poor financing, company owner George Pullman fired three thousand of the factory’s six thousand employees, cut the remaining workers’ wages by an average of 25 percent, and then continued to charge the same high rents and prices in the company homes and store where workers were required to live and shop. Workers began the strike on May 11, when Eugene V. Debs, the president of the American Railway Union, ordered rail workers throughout the country to stop handling any trains that had Pullman cars on them. In practicality, almost all of the trains fell into this category, and, therefore, the strike created a nationwide train stoppage, right on the heels of the depression of 1893. Seeking justification for sending in federal troops, President Grover Cleveland turned to his attorney general, who came up with a solution: Attach a mail car to every train and then send in troops to ensure the delivery of the mail. The government also ordered the strike to end; when Debs refused, he was arrested and imprisoned for his interference with the delivery of U.S. mail. The image below ([link]) shows the standoff between federal troops and the workers. The troops protected the hiring of new workers, thus rendering the strike tactic largely ineffective. The strike ended abruptly on July 13, with no labor gains and much lost in the way of public opinion. What was one of the key goals for which striking workers fought in the late nineteenth century? Which of the following was not a key goal of the Knights of Labor? Building Industrial America on the Backs of Labor by OpenStaxCollege is licensed under a Creative Commons Attribution 4.0 International License, except where otherwise noted.